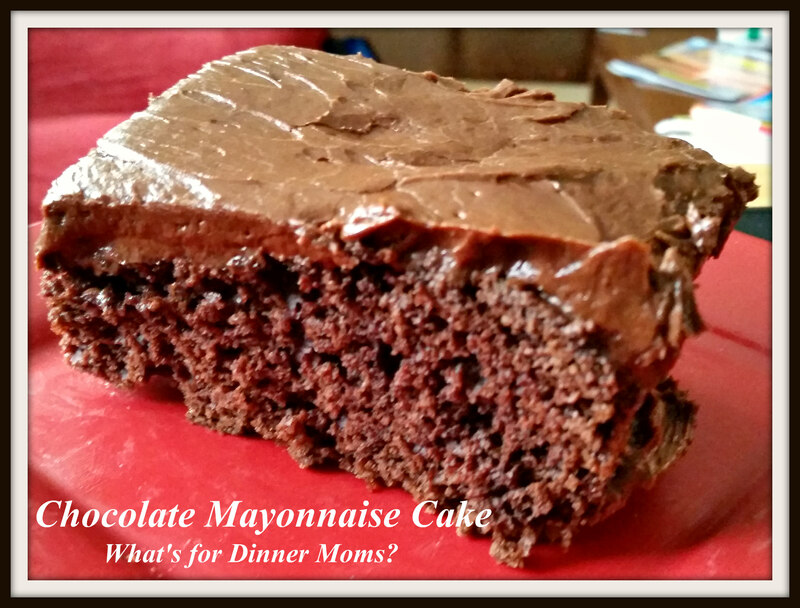 Old Fashioned Chocolate Mayonnaise Cake – What's for Dinner Moms? I remember my mother making this cake when I was a kid. She never put frosting on it (which was always my favorite part of the cake) because she said it was so rich anyways that it really didn’t need any. She would dust the top of the cake with a bit of powdered sugar but that was all. I remember the cake being really moist. It would almost melt in your mouth. When I was asked what kind of cake I wanted for my birthday this cake popped into my head. I had to have it. Yes, my birthday was over the holiday weekend. Not a significant one, I still have a bit longer for that. This wasn’t quite as good as my memories of it are but then again is anything? It was REALLY good though. It was moist, chocolaty and everything I wanted. The frosting was amazing chocolate buttercream. I would make this cake again and again and again. This is the original recipe from a Hellman’s advertisement in a magazine. Frost with your favorite chocolate buttercream or a dusting of powdered sugar. Pre heat oven to 350 degrees. Grease a 13 x 9 pan with butter and flour. Stir the mayonnaise into the dry ingredients. Slowly pour in the water and vanilla while beating the ingredients. Beat until smooth and well blended. Pour into prepared pan. Bake for 30 minutes or until center springs back when touched. This is perfect because it’s also World Chocolate Day! Didn’t even know that! That is a day I can celebrate. Awesome idea to add the frosting! It does look very moist Marci! Memories! My mother used to make this cake! She typed up the recipe (at about 2/3rds the ingredients—frugal she was!) and still baked it in the 9×13 pan. I haven’t made this in years. But it looks good in your picture and i just might try it the Hellman way and see if it’s better than I remember as a kid. Especially adding frosting! I have such strong memories of this as a kid it was hard to live up to but it was good. My Mom always put icing on hers. I too, had this cake for my birthday cake on several occasions. Yummmmmy! ! I’ve always thought the icing had a tad of mayo in it too. But, p probably not. It is DELICIOUS! ! Try it! ! Thank you! I will have to see if I can come up with a mayo frosting. Sounds interesting. Thanks.